We saw last week with the Biggest Loser study that basal metabolism plummets when you lose weight with calorie reduction. As contestants lose weight, they burn a lot less energy – up to 800 calories per day less than before. Some of that is expected, since there is less body tissue to maintain, but nevertheless, these contestants burn far less than expected even taking this into account. Even 6 years later, their basal metabolic rate (BMR) remains depressed, as do the contestants themselves. The story got a lot of coverage, but one thing was consistently missing. How to fix it.That’s what I’ll show you today, and it’s the opposite of what most people expect. 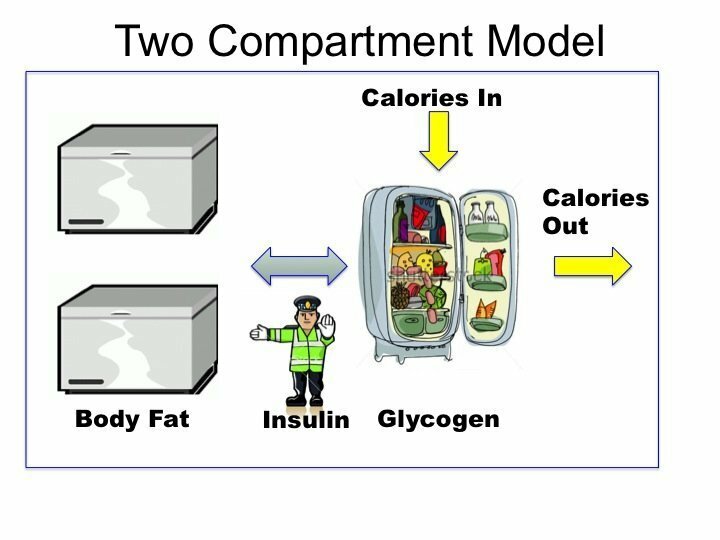 So, let’s think about this problem in the context of the 2 compartment model of obesity that we have used before. There are two compartments for body energy. We take calories in as food. This gets stored in the short term as glycogen, or long term as body fat. Glycogen is easily converted to energy (calories out), but body fat, not so much. So we can consider the analogous situation where short term energy is stored in a refrigerator and long term in the basement freezer. Insulin’s role is to direct food into the basement freezer. When there is excess food that can’t be kept in the fridge, insulin directs it to the freezer. This is body fat and manufactured in the liver by the process of de novo lipogenesis. What causes insulin levels to be elevated depends partly on the foods we eat, but also by insulin resistance. Fructose, for example, plays a key role in elevating insulin resistance which will, in turn raise insulin levels. 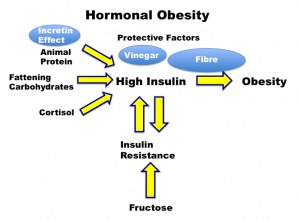 Insulin resistance leads to high insulin levels, which leads to higher resistance in a vicious cycle. That is, it can be self sustaining. So during weight loss, if we don’t address the long term issue of insulin resistance, then some of the incoming energy is directed toward storage of fat. At the very least, we won’t be burning fat. Our basal metabolism gets energy from two sources – food, and stored food (fat). If high insulin levels blocks our access to fat stores, then all of our energy must come from food. If we have reduced food intake from 2000 calories per day to 1200, but basal metabolism must also fall from 2000 calories to 1200. This is the logical response of the body. Where would it get energy from? Fat stores are locked away since high insulin will block fat burning (lipolysis). So, as ‘Calories In’ goes down, so does ‘Calories Out’. This is why the Biggest Loser contestants metabolisms plunged so heavily. This is the fallacy of the Caloric Reduction as Primary crowd. They only care about reducing calories in, and don’t realize that the game is all about ‘Calories Out’. Consider the analogy of soccer. Soccer’s First Law of Thermodynamics says that to win, you must have more ‘Goals In’ than ‘Goals Allowed’. Goals can’t be created out of thin air. So, therefore if we increase the numbers of ‘Goals In’, we will win every game. So, we move our goalie and position players all to forward and ask them to stay in the attacking zone. Of course, we lose every single game. By trying to increase ‘Goals In’, we’ve increased ‘Goals Allowed’. The mistake is to assume that increasing ‘Goals In’ will not affect ‘Goals Allowed’. Then we blame players for not trying hard enough. But, in truth the strategy was bad. Same goes for ‘Calories In’ and ‘Calories Out’. Reducing ‘Calories In’ will result in reduction of ‘Calories Out’. You’ll lose every single time, as the Biggest Loser proves. The mistake is to assume that reducing ‘Calories In’ will not reduce ‘Calories Out’. But it does. Every single time. Then we blame patients for not trying hard enough, but in reality, the strategy of ignoring insulin is bad. So, are we doomed to a life of ever growing waistlines? Hardly. Remember, the key to weight loss is to maintain energy expenditure (calories out). If you simply increase food intake again, you’ll simply increase weight. So, what to do? There are two compartments here. The body will get energy from food, or stored food (fat). So the answer is to unlock the door which is preventing us from accessing out fat stores. It is the high insulin levels that is keeping all the energy locked away in fat. Insulin is blocking the door so that we can’t get to that basement freezer. Once we understand that, the solution is simple. We need to lower insulin. The key is to release all the pent-up energy stored in the body fat. The crucial junction in weight gain/loss is not the calories, it’s the insulin because that is what opens up the door to release the fat for burning. Lowering insulin will allow fat burning (lipolysis). This provides our body with lots of energy. If we have lots of energy coming in, the body has no reason to shut down its basal metabolism. The quickest, most efficient way to lower insulin? Fasting. Ketogenic diets will work, too. But remember that insulin has many inputs and is not simply carbohydrates. Cortisol, protein, fructose, insulin resistance, fibre, vinegar and countless other things play a role in determining insulin levels. Generally, though, cortisol and insulin resistance are the things least likely to be treated. Once the doors to the ‘fat’ freezers are open, the body says, “Whoa, there’s lots of energy here. Let’s burn a little extra”. Studies of fasting show that basal metabolism doesn’t shut down during fasting, it revvs itself up. Four consecutive days of fasting increases basal metabolism by 13%. Studies of alternate daily fasting (ADF) shows the same thing. Basal metabolism is maintained, even over 22 days of ADF. Even with weight steadily decreasing, the resting metabolic rate is statistically identical at the end of 22 days. You can see from the table below, that carbohydrate oxidation plummets as fat oxidation rises, just as seen previously. This is an important point. In standard caloric reduction strategies, the body reduces its caloric expenditure to adjust to the reduced caloric intake. Stores of energy locked away as body fat are not available. If your reduce your calories from 2000 to 1200 per day, then your body is forced to reduce calorie expenditure to 1200 per day since it cannot get any from the stored food (fat). Where’s the extra energy going to come from? However, by lowering insulin drastically during fasting or alternate daily fasting, the body does not shut down. Instead, it switches fuel sources. No food in coming in. Insulin falls. Your body has a choice. It can reduce calorie expenditure to zero, also known technically as ‘dropping dead’. Or, it can force open the reserves and power itself from fat. Lowering insulin makes it much easier to open up these stores of fat. That it’s normal job. When you eat, insulin goes up, fat goes into storage. When you don’t eat (fast), insulin goes down and fat comes out of storage. Dr. David Ludwig showed a similar result when comparing diets. 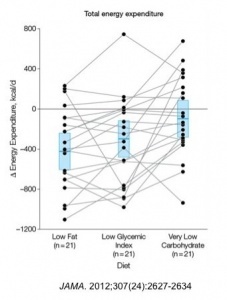 In his study, he compared the total energy expenditure after weight loss with three different types of diets – low fat (standard advice), low glycemic index and very low carbohydrate. The low fat diet does nothing to reduce insulin levels. So fat stores are blocked from being used for energy. Basal metabolism drops almost 400 calories per day. But on the other extreme, very low carbohydrate diets would be the diet that lowers insulin the most. This allows access to the basement fat ‘freezer’. Now our body has the energy it needs to start revving up its metabolism. It works with surgically enforced fasting such as seen with bariatric surgery, too. The one contestant, Rudy Pauls, who got bariatric surgery fixed his wrecked metabolism. So, is it possible? Definitely. 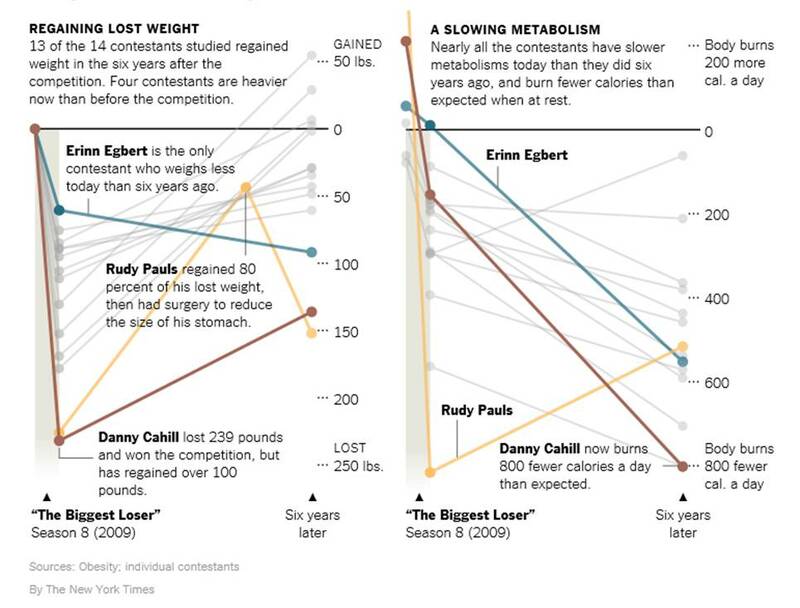 Rudy Paul’s metabolism had slowed more than any other contestant. That’s why his weight regain was so dramatic. By forcing himself to fast, he has partially repaired his broken metabolism. In order to fix our broken metabolism, we need to allow free access to the energy contained within our fat stores. We need to allow fat burning (lipolysis) to proceed normally. We need to lower insulin. The answer is low carbohydrate diets, or even better – intermittent or extended fasting. Fasting maximally lowers insulin and ignite the flames of fat burning. Caloric reduction wrecked our metabolism by causing it to shut down. How to fix it? Do the exact opposite of what you expect. Push your caloric intake towards zero! 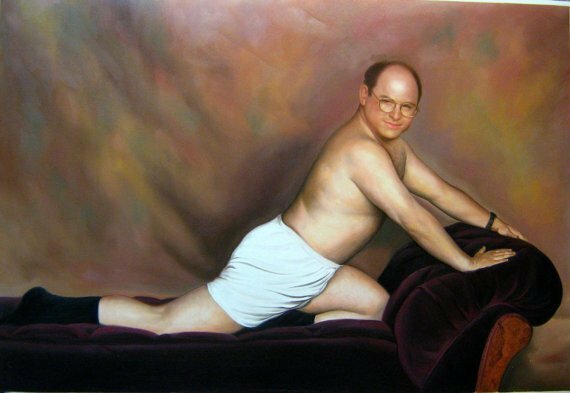 This is the George Costanza method. If everything you do makes things worse, do the exact opposite. It does not matter if you think it doesn’t make sense. Do it anyway and see what happens. The standard nutritional advice given – to Eat Less and Move More is so bad, that doing anything, even the exact opposite beat it. I think the best thing is LCHF plus fasting if needed, and as much as is needed. I hardly ever do it other than by accident. You do feel really sharp when you do it, though. I think this is a good choice, I use it to control my diabetes. This article is right on, it is all about insulin. When insulin is high you can not use stored fat. There was a fat rat experiment where rats insulin was kept high, they starved to death, fat. The fat could not be used because of high insulin levels. For me Low carb barely made a difference. I really noticed a difference when I started the fasting. For some one who is new to this, what fast recommendations are there? Looking for recommendation of frequency and duration. Also do you continue taking your Diabetes medication during this process or do you stop? Thank you, once again, Jason, for a fantastic post! Love your sense of humour……. I’ve been in LCHF diet plus fasting every day (alternating 16h/24h) and the results are outstanding. Lab and life style reflect the good results I achieve. Took almost a year of preparation for that, but it worth every effort. Do you eat lunch and dinner one day and only dinner the next day? Or lunch and dinner one day and nothing the next? I’ve been using longer fasts (say 2+ days) but am thinking of eating lunch and dinner twice a week and only dinner three days a week, for the workweek. Then probably eating lunch and dinner Saturday and Sunder, although I might eat breakfast every once in a while. I think the idea of eating all the time came from stabilizing blood sugar…for diabetics. They then assumed that this would apply to everyone. This is of course incorrect and has caused major damage (as has the whole low fat debacle). But I think they meant well. I wish I had a health care provider like you in my life, Samantha! Thank you Dr. fung, I too love your sense of humor and always look forward to your new blog postings. Thank you for taking the time to keep us all inspired and on the right track. Your book was also great! I met with my endocrinologist yesterday and they said, “Fasting in the long term will make insulin resistance worse”. But when I wasn’t fasting my numbers hardly improved, but yesterday my results showed improvement after I started fasting. I feel so bad because so many people get bad information from doctors who don’t know any better. Very concerning that an endocrinologist doesn’t seem to understand the very large difference between pathological IR as seen in T2DM vs physiological IR as seen in LCHF/fasting. Did you ask them to explain how this actually occurs? Also how fasting doesn’t result in very high blood glucose if that was the case? Isn’t that sad. I don’t trust most doctors and really never have. I guess I just follow my gut and what feels right. But if we fast aren’t we really Eat Less (zero/very little food coming in) and Move More (more energetic that makes us move more)? tony my understanding of the article is when low calorie diet the body wont go to fat store and use food ingested all the while insulin levels remain high further blocking the burning of fat. In fasting insulin levels leading to fat burning. I meant to say insulin levels drop leading to fat burning when fasting. All foods induce an insulin spike, putting the body into a fed state – lipogenesis. When you are constantly snacking and constantly eating, you are keeping the body in a Fed state with high insulin, where your body is not pulling energy from fat stores. This is different than bringing your insulin levels low enough to enter a fasted state lipolysis in order to oxidize and free up fatty acids from fat stores for energy. You are right Tony low calorie diets do use fat when they are severely restricted. Somewhere on this site is post comparing diets reduced by 25% of calories to fasting. In that blog post Dr Fung talked about insulin levels staying high and blocking fat loss. I think you have to consider short term fat loss compared to long term. Low calorie intake may force your weight down in the short term, but your body will keep fighting you every step of the way, and eventually ‘win’. By lowering your insulin and cortisol levels and reducing resistance, you are lowering your set point, and thus your body will not fight to maintain the higher weight. IF=NOT eating for certain periods of time and consuming fewer calories. The emphasis should be on the NOT eating period, THAT provides the most benefits. not eating is calorie restriction. timed calorie restriction versus multi spaced meal calorie restriction. i’ve been doing this a while and all the window does is make it less likely to impossible to eat in calories what I would with a couple meals a day. it’s not something new – it’s just a re-brand with no snacking and plenty of fasting that results in calorie restriction also. i get the low insulin levels. i think the intermmitent fasting naming/ branding is gimmicky. Agree w Dr Garry Lee. There is that dreaded keto flu that I experienced week one of VLCHF… and I was still eating! I can’t imagine going through that transition AND enduring my first 24 hour fast. Once that ‘hangover’ feeling kicked in, I’d probably never try it again. I suspect people who try 16:8/short regimens and feel ok aren’t really tapping their fat stores too much. I tell my friends who want to try to do a 2 week or longer VLCD (eg dietdoctor.com), get the flu out of the way, and THEN introduce different IF regimens. Virtually effortless. When I eat myself out of ketosis, and drop back into keto, my keto flu lasts about 10 mins. I have on occasion dropped back into ketosis while still eating. of course in the last 6 months I must have spent less than 3 hours out of ketosis. Vinegar & fiber are mentioned but thee is really no explanation of what they do. If you’ve written about them before, could you please link to the articles? My take was that “Reducing calories wrecks metabolism”, so what’s the fix? The ‘obvious’ answer would be “Stop reducing calories!”; the opposite of this ‘obvious’ answer is “Drop calories to ZERO! !” (intermittently). Hi Sloan, there is a search box near the top, just type in and the appropriate articles will appear. Go to the search function and type them in .. they’re there .. it worked for me when I tried it. That is not a falling apart at all. It is the exact answer. You need to eat more of the correct foods and stop doing hours of useless exercise. Dr Fung: I gotta say that as a layman who has studied the diet/nutrition/health axis intensely for many, many years, I find that your work has floated to the top of my pile of the incredible Docs and scientists who take the time to post about the science of optimal health. Clearly keeping the pancreas as quiet as possible is the critical path for sustained lifespan/healthspan. Thanks for taking the time and making the commitment to do this great work! Greetings again Dr. Fung….another great post. I hope I’m not being a bother but may I ask again for a post on fasting and CKD/ kidney health? Surprisingly I can find very little on the subject other than a great article by Robb Wolf. Many of the fasting “haters” out there mention potential negative effects on kidneys if fasting. Of course, being a Kidney Doctor, I’m sure fasting has, at the very least, no major negative effects. Robb’s article mentions a case in which three weeks of hclf led to CKD recovery. How does vinegar help or derail us? What impact does it have on our diet? It lowers insulin. Some IF’ers I know take some every day. Personally, I can’t get the stuff down! I have romaine salad almost daily. I toss it with AC vinegar before I make the salad, even if I add a different dressing..tastes great. I have begun taking 450 mg apple cider vinegar capsules with each meal. Not sure if it will react the same way that regular apple cider vinegar does though. Dr. Fung, what is your opinion on this? My husband started out with regular apple cider vinegar. Then switched to the pills because he hated the taste. But those were not as effective! So then we switched over to organic mother apple cider vinegar. The taste is better and the effectiveness was by far the best! We actually pour ourselves an 8 oz glass of water, add some soluble fiber and the vinegar and drink it down before every meal and 2 T of vinegar at bedtime. Works wonderfully!! As a housewife, I can readily identify with the “freezer” part of your analogy and diagram. How would you modify this advice for a type 1 Diabetic, producing no insulin, with weight to lose? Modify their insulin dosages as low as possible gradually? I have heard of type 1s getting some type of relief from hflc. You want to check out Dr Richard Bernstein. He’s a T1 diabetic and engineer and pioneered the use of the type of glucometer you can buy in any drugstore today. He left his engineering career and went to medical school so he would be taken seriously when advocating the tight glucose approach to managing T1 he was using for himself. His book is Dr Bernstein’s Diabetes Solution. Bariatric surgery results were the inspiration behind the Newcastle Diet according to Professor Roy Taylor. My personal experience on 600 calorien a day diet was one of weight loss and blood sugar levels falling to normal. Once you have done that it is easy to transition to full on fasting. Taking things slowly and seeing how you react to shorter periods of fasting and slowly increasing the length of your fasts should minimize the risk. Personally I did not experience a starvation response and it was not my first fast either, I had many shorter fasts of varying lengths under my belt before attempting that one. Please excuse typos in post above – no edit ability. A couple of the obvious errors were: “IT” meant “IF”, “he” meant “you”….etc. etc. etc. DrCollins – did you get a response to your question? I’m very keen on knowing this as well. Thanks! That is really sad that you have to fast for 24 hours have you tried Metformin for insulin resistance as I have a ton but have not tried it at all. I heard it breaks it but going through same thing here. My metabolic nightmare started in the ICU. Steroids saved my life. But while in the hospital, they started giving me insulin. I started as an athlete and became gooey. Gained just under 100 pounds in 8 months. I did exactly what they told me. HCLF and mild cardio. Before I found Dr.Fung, I went back to my athletic routine. I am now intermittent fasting and LCHF eating. I have lost 30 pounds since January and have gone from 48%BF to 38% BF. I am off insulin and several other medications. I can not thank you enough. Very informative post, as always. So on the subject of alternate day fasting being as effective as long fasts, 500-600 calorie on “fast” day does NOT “shut down” or slow our metabolism, is this why it still effective? Yeah, what if we “fasted” by eating only 500 calories a day for several days? @Pam well that’s not very sustainable way to go about it, I know that much. I am wondering how an HCG diet affects the metabolic rate? I really hope I haven’t messed it up for good. Do the hormones you take during HCG keep your Metabolism from dropping as it does with normal restricted calorie diets? I am starting IF and LCHF diet hoping to keep the weight off and increase metabolic rate. Does anyone know the answer?? It’s confusing, because the Biggest Loser contestants also built substantially, increased muscle mass, the presence of which I associate with increased metabolism? 1200 calories is not enough for the body. Fasting is not enough calories for the body. The body recognizes that it needs to acquire energy from somewhere, because it isn’t enough, so we need energy to go kill an antelope. 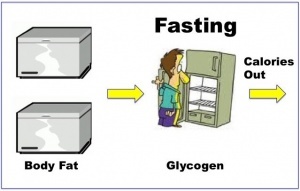 Fasting, it draws from fat stores more easily, and maintains or elevates metabolic rate. 1200 calories, it does NOT draw from fat stores as easily, and it does NOT maintain or elevate metabolic rate. High insulin levels vs low insulin levels while fasting, according to Dr Fung that’s the difference J. Emery. I am reading an article published by UHN News about an Epilepsy diet clinic at Toronto Western. Dr. E.D Bercovici advises patients to consume high-fat, low carb food options at Canada’s first adult epilepsy diet clinic. The clinic is designed to provide an alternative treatment path for htose with difficult to control epilepsy. “If what your doing now isn’t working try the opposite” that’s a quote from memory Doc. Soooo, does fasting work if I only consume say 500-600 calories a day from Coconut Milk in my Coffee in the AM? Or do we really need to get Calorie IN down to ZERO for the day? Although true fasting is zero calories Professor Roy Taylor successfully treated patients with type 2 diabetes on a 800 calorie per day diet for 8 weeks, Called the Newcastle Diet. Six hundred of the calories were from sugary shake called optifast I think. In a recent post Dr Michael Moseley’s book shows you how to reverse diabetes on 800 calories per day using normal food. If you can go to zero calories it should speed up the process. Some IF days I have coffee w 1tbsp butter and 2 tbsp coconut oil; some days I have zero cals. I personally have not noticed any ‘stall’ when I have fatty coffee (<500 cals total). Not sure re the science. I would like a proven answer as well (if one exists). Try to do a very-low-carb, moderate-protein, high-fat diet… also check your circadian rhythm, have plenty of sleep and get your Vitamin D from sunlight – best time in ME is around 10am to 12noon, when your shadow is shorter than you. I have a question; If I’m able to reverse diabetes type 2 by fasting, eating less carbs etc. Will I have to keep doing this for the rest of my life, or could I re-introduce certain foods like rice and bread eventually BUT in small amounts and not too often? Once you get into the habit of fasting then the occasional feast should be well tolerated indeed IMO necessary. When you eat those old foods you craved they will not taste as good as they tasted in your imagination and their hold on you will be broken. Your old cravings will be replaced by cravings for healthy food. If you deny yourself too much psychologically those old forbidden foods will eventually turn into overwhelming urges. Best to look forward to having them on occasion. William Banting discussed this in his 3rd Edition of ‘Letter on Corpulence’. He said he allowed himself some liberties, but kept an eye on things. If he noticed a drift in the wrong direction, he would get ‘strict’ again and pull things back. Sounds like a reasonable strategy. Kat, I totally agree with you. Can we fix insulin resistant? At the very least you will get improvement but yes people have fixed insulin resistance and brought their a1c back to normal. Good for you Kat. This gives us all more hope. Can you give me an example of what you eat in one day please? I’m having some similar struggles. Actually, in Obesity Code, Dr Fung states having a little cream with coffee is acceptable. I was concerned over that issue as well. Certainly nothing wrong with drinking black coffee though. Just, if you hadn’t gotten Obesity Code, you might not realize coffee with a little cream is OK. For myself, I use 1 mini moo (10cal) and maybe a half oz of fat free. If we had 2% or whole milk, I’d bag the mini-moo but even at that I think the entire cost of coffee and creamer is like 20cal, not 400 or 600. How would you incorporate a vegan diet into this program? This is fasting Jennifer, when fasting all food intake stops, that’s it, does not matter what diet you are on, when breaking the fast just resume whatever diet you normally eat. “also known technically as ‘dropping dead’.” I’m still laughing! usually Dr. Fung has links to the articles he is discussing. does anybody know what article is mentioned above. i am referring to the table 2 graph and the jama 2012 mention. i usually look it up by author but neither is mentioned. I just read about scientists in norway finding a potential cure for type 2 diabetes using “appetite surpressing hormones” in diabetes medication. Does this therefore confirm that fasting also cures diabetes? Do you ever check your blood sugar when you do this? Just curious. No. But your suggestion is good. Next time I try the potato hack, I will check blood sugar. Recent fbs around 80-85. I have red somewhere that some fitness enthusiasts have one day a week with very high carbs and calories intake. This so called feeding day they say is for maintaining their leptin by tricking the body that there is more than enough energy (food) comming and the baby shouldn’t be “worried” and going into a “saving mode”. I’m going to try the potato hack starting tomorrow. Thank you for posting this information or else I would not have known about it. Thank you again! Dr. Fung why do people such as Mark Sisson at Marks Daily Apple keep saying that women shouldn’t fast? Its confusing and getting really super annoying. I don’t know what to believe or who to believe anymore. The article I read was annoying. Made it sound like women are so much more delicate than men, which is annoying in of itself. I actually trust you more but I still feel confused about it. What the hell? Wendy, I am not Dr Fung but I did happen across a blog entry here entitled Women and Fasting. I am sure you can google it. I have also been going around in circles. Hi mark, I believe the answer lies in the types of foods as well as the timing.. In “groks” time the foods that may have been scarcly consumed were not pumping out insulin like a modern snack food does. On top of that.. Grok was staring from a point of normality with regards to insulin sensitivity and not a damaged feedback system as many of us have developed over years of high PROCESSED food intake. Even Tom Hanks thinks he can reverse his T2D .. I hope he has been reading your work. I had been using an incorrect email address which this last (repeat) post corrects. If I recall correctly, there is a period of zero food(fasting) directly before and after (and of course,during) the bariatric surgery, which may cause changes to gut flora and do a reset to their metabolism. So it may be this small window of fasting that allows them to be successful thereafter. Hello Dr. Jason Fung or anyone who can answer. I am an obese person, because I went from 127 kg to 105 with Lowcarb diet and now with fasting, my intention is to lose more weight. I was fasting every other day but with time spent doing daily from Monday to Friday, leaving as few free Saturday and Sunday. I have the following question: do fast 23: 1 with power around 1000 calories, this form of fasting can harm me in losing weight?